Over the last two years, Amazon has amassed a real-estate portfolio in Bellevue in excess of 1 million square feet, room enough for several thousand employees. On Wednesday, Seattle employees in the company’s enormous operations organization — responsible for the delivery of orders to customers — learned that their jobs would be moved over the next four years to the city across Lake Washington. “Our vision is to create an urban campus in downtown Bellevue where employees will all be within walking distance of each other and have easy access to public transit,” said Dave Clark, Amazon senior vice president of worldwide operations, in an email to employees. A swirl of factors is driving Amazon’s expansion in Bellevue. Many tech companies, including Amazon’s top competitors for talent, have or are developing large offices on both sides of the lake to appeal to workers who would rather not commute. Amazon’s fraught relationship with Seattle City Hall is also in the mix, with the 2018 head-tax fight still reverberating and the uncertainty of a wide-open City Council election later this year. But a company source said part of the motivation is to free up space in Seattle for new hires. Amazon in a statement praised Bellevue, where Jeff Bezos founded the company in 1994, for its amenities, quality of life, talent pool and “business-friendly environment.” Bellevue leaders cheered the news. Meanwhile, Seattle Mayor Jenny Durkan described Amazon’s Bellevue growth as a net positive for the region. Amazon’s move to Bellevue will take place in phases, beginning this month with Amazon’s Global Delivery Services organization — a part of the broader operations organization with fewer than 1,000 employees, who would join about 700 Amazon workers already in Bellevue. Clark said additional moves will happen early in 2021, with teams notified about a year in advance, and the entire move — several thousand jobs, including future operations hires — is to be completed by the end of 2023. “This will give people as much time as possible to plan for these changes while also allowing us to finish construction and build out of our new space,” Clark said in the email, first reported Wednesday by GeekWire. With the addition of Amazon jobs and with other companies moving out of the area, downtown Bellevue will see a gain of about 2,500 new jobs, Bellevue Mayor John Chelminiak said. 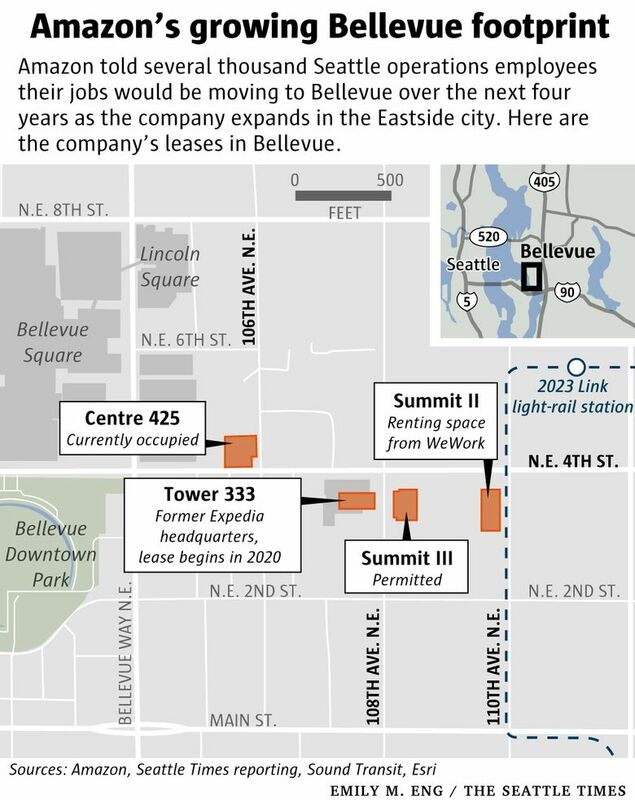 Amazon has leased space in three downtown Bellevue office buildings, all within a few blocks of each other, starting in late 2016 with Centre 425 at the corner of Northeast Fourth Street and 106th Avenue Northeast, with room for more than 2,200 people. Last summer, it signed a lease for the former Expedia headquarters at 333 108th Ave. N.E., set to begin in 2020. Expedia is moving from Bellevue to Seattle, with a planned opening this fall for 4,500 employees. The latest Amazon lease is the Summit III project, a 17-story office building at 320 108th Ave. N.E., that is permitted but not yet under construction, according to several real-estate sources, most recently Kidder Matthews’ quarterly market report. Developer Hines Global REIT declined to comment on the project. Amazon is also renting space from WeWork in the nearby Summit II building, according to an Amazon source. The projects are all within a few blocks of Sound Transit’s Bellevue Downtown Link light-rail station, scheduled to open in 2023. Travel time on the train from Bellevue to Westlake Station will be around 24 minutes. Chelminiak said it makes “all the sense in the world” to have growth along transit corridors. The company in 2016 launched a bus service, called Amazon Ride, to help employees on the Eastside get to Seattle. Even as it grows in Bellevue, Amazon continues to add to its enormous Seattle real-estate and employment base. The company has about 10 million square feet of space in the South Lake Union and Denny Triangle neighborhoods of Seattle, with another 2 million square feet under construction. That said, the company has backed off another major Seattle office, subleasing space in the under-construction Rainier Square tower, a project it had threatened to abandon if Seattle imposed a tax on businesses to fund housing and homeless services. Some observers have speculated that Bellevue could be the eventual site for some of the 25,000 Amazon jobs anticipated as part of the company’s scuttled New York City expansion. But Amazon’s top real-estate executive said in an interview last month that the Bellevue expansion is not a result of the New York pull back, but rather a separate plan in the works before the company’s “HQ2” decisions. Chelminiak said that as Amazon grows, the city wants to see some of those new jobs in Bellevue. Amazon’s Eastside growth follows a long-established pattern for tech employers in the Seattle area. Google and Facebook — two of Amazon’s top competitors for employees — have offices in Seattle and on the Eastside and are hiring rapidly in the region. Microsoft, in the midst of a remodel of its longtime Redmond campus, opened a South Lake Union office in 2007 as part of a plant to accommodate Seattle workers, but closed it about a decade later after the Westlake Terry building was leased to Amazon. The company still has a small group of employees working from a WeWork space in Seattle.